To my fellow readers on this blog , you know how much I love pizza specially lower carb pizza crust. I published so much pizza crust recipe on this blog and my inspiration is unlimited when it comes to make pizza with extra veggie and less carbs. I choose to use Kale in this recipe because of it is known as one of the best superfood out there right now. I read a great article about the benefits of Kale on Well Being Secrets recently. It listed 23 science-backed health benefits of kale – read more HERE – including its role in diabetes and it clearly convince me to add more kale to my diet. My all time favorite low carb pizza crust has always been the cauliflower pizza crust but with spring coming up I love adding some green color in my plate. That is why I created this Kale Pizza Crust. I used some gluten free panko breadcrumb in the original recipe which is not the lowest carb option for this recipe but my family loves the crust with pork rind too. So feel free to use your favorite option. We often wonder how to cook kale? but for this recipe there is no need to cook kale. Simply wash and trim the kale leaves and process them into the food processor with the rest of the ingredients. This kale pizza dough is made within 15 minutes and it bake very fast – less than 15 minutes. I pre baked the crust for 15 minutes then return in the oven for 5-8 minutes with the toppings on. Do not over bake this kale pizza crust or you will loss all the moisture and end up with a dry crust. This recipe contains a good amount of cheese and I used low fat grated cheese for the crust and I sparingly add cheese to the top of the pizza. However you can avoid the cheese on the top of the pizza as the crust is already very cheesy. Again, I love this recipe simply because it is a surprising vegetarian appetizer with lovely green and red colours for springs. It is loaded with healthy vegetables – except from the kale into the crust I topped my pizza with home made tomato paste, fresh mushroom, tomatoes, fresh avocado and chilli. 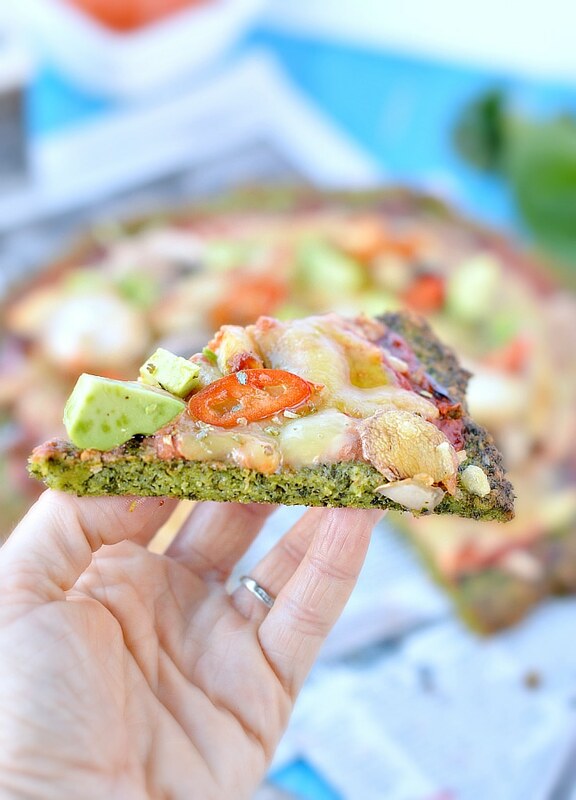 You will not overeat pizza with this kale pizza crust because you will be fulfilled very quickly and simply enjoy pizza with health benefits! 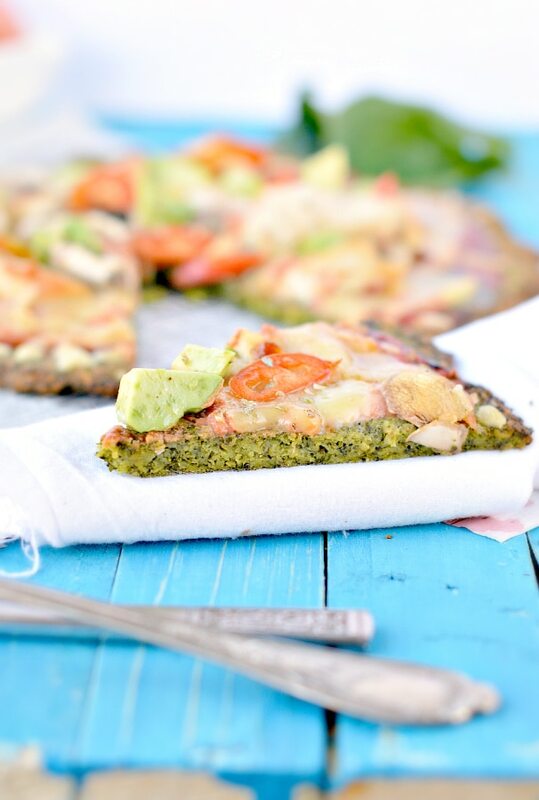 If you are looking for other green pizza recipe check my spinach pizza crust recipe. Nutrition panel for one slice. This recipe makes 6 slices. How long can this last in the refrigerator or freezer and still be good to use? Hi Andrew, After baking it can last up to 3 days in the fridge. Make sure your cover the plate to avoid the pizza to dry. You can simply rewarm the pizza in the microwave until hot- about 1 min30 /2 minutes. I also freeze slices of this pizza in airtight container for my hubby lunch. He simply defrost the box the night before work. Then, he microwave the pizza at lunch until hot. The crust gets softer when rewarm in the microwave so we usually eat the pizza on a plate with knife and fork. I hope it answer your question! Enjoy. Carine. I made this today, it was great!!! I am cutting carbs so I used pork rinds instead of panko and it turned oit perfect! Hi Aly! What a lovely idea! I love pork rinds too this is such a great low carb ingredient. I have to try your recipe now, makes me hungry 🙂 thanks Carine. That’s so smart! I was also thinking maybe you could toast the kale in the oven and put that in the crust to give it an extra (healthy) crunch! Hi Kristen, Indeed this is a great idea! But I love the fast option where I simply add all my ingredients to the blender. It makes the crust in a minute without any pre cooking required which is such a time saver with kids! Let me know if you try another option! Would love to know how it taste. See you around the blog sometime! xoxo. Carine. People just need to STOP trying to turn vegetables into pizza crust. On a low carb diet? Who cares?! You can splurge every now and then and just get back onto your diet. You only live once! Hi Jennifer, well nobody push you to eat those pizza recipe if you do not like too. It is great to have an open mind around food. If there is so much pizza crust recipes with vegetables as a substitute of flour it is simply because there is lots of people who can’t eat carbs. I do love those pizza because it is low carb and does not impact my diabetes (Blood sugar level). It is the only way I have to enjoy a pizza so even I only live once I prefer to live it as long as I can. And if it means adding veggie to my pizza crust I am very happy with that. Carine. The linked Aleia’s Gluten Free Panko Crumbs are 7g of carbs per 14g serving. The recipe calls for 55g of them for 27.5g of carbs. Carbs for cheese vary by type. A cup typically approaches 10g. Let’s be generous and call this base 35g of carbs. Or getting on for double your daily intake for the induction phase of a low carb diet. Hi Nick, It is a lower carb pizza recipe compared to white wheat recipe. I am a pre diabetic not a strict low carber. I do not count the carbs. I simply check my blood sugar level to keep it on track and all I can say is if I eat the same toppings on a white wheat pizza recipe my sugar level spike. With this recipe I am fine. Thanks for your extra calculation and input that may be useful to people following a strict low carb diet. Carine. Hi! Can you clarify the amount of kale, please? Do you mean 3 cups + 3/4 cups (3.75 cups)? Thanks! Hi Lizzie, Sorry for that typing error. You will need 3 3/4 cup of kale so yes 3 cups + 3/4 cups 🙂 Enjoy this lovely pizza crust! Carine. delicious. I never thought the kale would work, but it did. of the stickiness, use gluten free flour. Hi Amanda, I love this pizza crust too! So surprising how kale works well in this recipe. Thanks for adding your experience. I used olive oil but I never thought about gluten free flour, I will try next time. Thanks Amanda for your lovely comment! See you soon on the blog 🙂 Carine. Hi Aj, I am not sure what you can use instead as eggs are an important ingredient in this recipe … as I did not try this recipe egg free it is very difficult to give some guidance on which ingredients you could use instead. It may work if you increase the amount of cheese and add some spelt flour in the mix until it forms a ball as on the picture. Let me know if you try anything I am keen to know how this recipe will be adaptable for egg allergy. Carine. google egg substitute using chia seed and water. If you get ground flax seeds then mix 1 tbsp of flax with 3tbsp of water (called a flax egg) and let it sit for 10 minutes it creates an egg like texture! And shouldn’t change the taste too much. One “flax egg” would be equal to one egg. If a recipe says 1 large egg then use 1tbsp flax with 2-2.5 tbsp of water depending on the size of egg it’s called for. I use this replacement in EVERYTHING and works great! Thanks Jade for your tips! We love cauliflower crust pizza but I find it a bit labor intensive. I just made four batches of this recipe so we would have some crusts to freeze. I made them personal size cooked in my waffle iron…lots of crispy nooks and crannies for sauce. My taste testers–husband and nine year old–were happy to eat them just dipped in pizza sauce. Thank you for giving the weight measurements! I hate trying to measure leafy or grated things! Hi Amanda, I exactly feel the same way with cauliflower crust. It taste great but the cauliflower drying step makes me crazy and you always have a stingy towel to clean after that ahaha 🙂 I am glad you enjoyed the kale pizza crust. I never tried to bake it in the waffle iron but it sounds like a great idea for kids! Thank you for taking some time to share your experience in the kitchen with this recipe. I really appreciate your ideas. See you soon on the blog! Carine. Can I use fat free shredded mozzarella for the crust? That’s what your photo looks like. But I also have pecorino romano grated cheese if that might be preferred. Or a mix of the two? Thanks! Excited to try. Hi Elizabeth, don’t worry the low fat shredded mozzarella should work well! I did the crust many time now using different sort of cheese (edam, low fat cheddar, parmesan) and it always goes well. Let me know if you like it ! I am very excited to have a new recipe tester for this lovely pizza crust ! Enjoy and see you soon on the blog! Carine. Hi! I love the flavor of this pizza, but I’ve tried to make it a couple of times and the crust always sticks (a ton) to the baking paper. Any hints to prevent this? Hi Meg, It is funny I recently read two comments where like you people have difficulty to un stick thinks from baking paper. Both lived in the US so I don’t know if it is a difference of baking paper between countries -I live in New Zealand. I do this Kale pizza crust really often times without problem to un stick it from the paper (as you can see on the pictures). But if this happens you have to spray some cooking oil on the paper before you arrange the crust on it. Usually this help a lot! Thanks for following my recipes and I hope to hear from you soon! Carine. Hi Emy! I am very happy that you find my blog and funny recipes 🙂 this pizza is a fun pizza to make with the kids or to simply eat a little bit healthier. All my family loves it. Enjoy the recipe and I hope to see you soon on the blog 🙂 Carine. Could you use almond meal in place of the panko crumbs? Hi Sheila, I never tested the recipe with almond meal. It should work but you may have to increase the amount of almond meal up to 1/4 cup because the panko crumb really hold things together. Or try 50% panko crumb 50% almond meal. It will still cut the carbs without changing the texture too much. I hope you give it a try, it is a delicious pizza crust. Enjoy, xoxo, Carine. How can this kale pizza be wood fired oven made? This whould be amazing in flavour amd texture! Hi Eloise, I never wood fired the pizza but I sure this will work perfectly and taste amazing. Let me know if you try ! Carine. haha I love the surprisingly 🙂 but I understand what you mean it is not a classic recipe and it could be confusing at first to use kale in a pizza crust. Glad you love it ! Thanks for following the blog and testing my recipes! xoxo Carine. 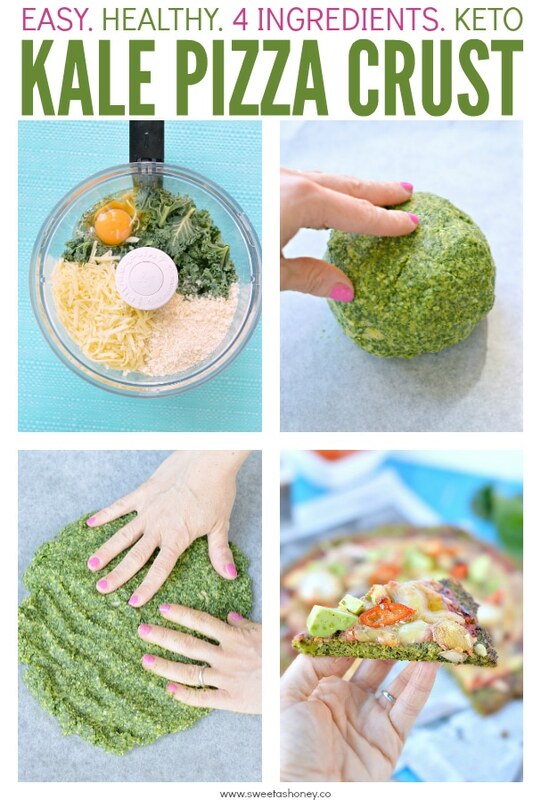 Hi, I never tried to freeze this kale pizza crust – I did with the cauliflower crust – but I am sure it is ok. I usually prefer to roll my veggie crust first, prebake 10 minutes and freeze. I always wrap the pre baked crust into foil then store in a airtight plastic bag and freeze. When I need the crust I don’t defrost it. I add my toppings and I bake directly in a warm oven. Enjoy the recipe! Carine. Is it possible to do this recipe without a food processor? Hi, I am sorry but no, you will really need a food processor to process all the ingredients together and make a consistent pizza crust batter. I hope you try it anyway ! xoxo Carine. This was surprisingly good. Husband was intrigued by green crust but took awhile to guess the ingredient. Must have liked it as he asked for a second slice. I didn’t use baking paper, just sprayed the pan with a non-stick baking spray (Pam). Thanks for the recipe. Thanks for the lovely feedback! This is always a big win when I can bring my husband to eat healthier food! I am so glad your husband love that pizza. Thanks for the tips too, less baking paper is always great to save some $$$ 🙂 Have a lovely time on the blog, XOXO Carine. 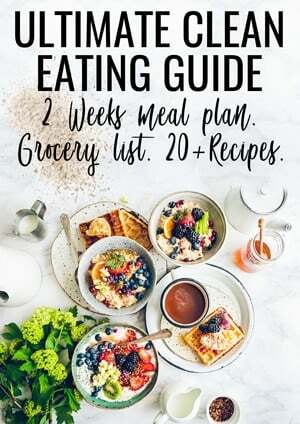 Hi Karine, I’ve recently started a Keto diet and discovered your blog! You are definitely my go-to authority for any baking goodness (I miss bread so much!). I have tried your rolls (great) and bread (it’s cooling now, so haven’t tasted it yet). Bonjour/hello ! 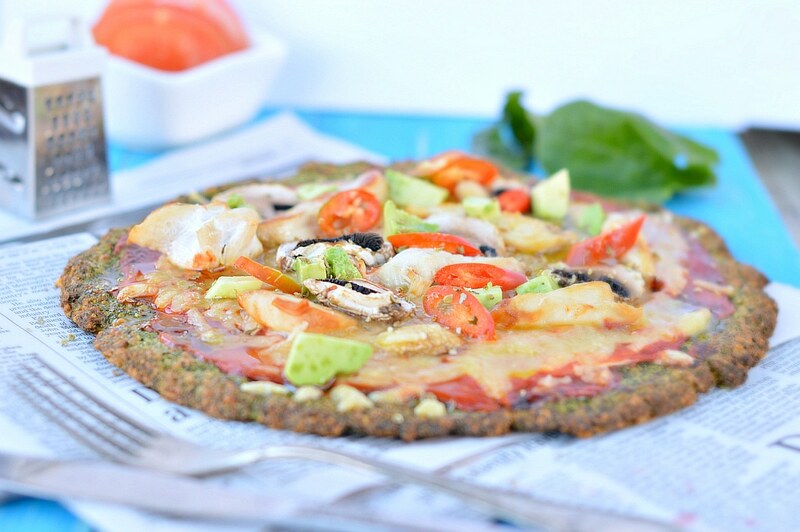 I would suggest you try my coconut flour pizza crust. You really need pork rinds in this kale pizza crust or it will come out too wet. Enjoy the keto low carb recipes on the blog. So excited to have you here form the UK. XOXO Carine.